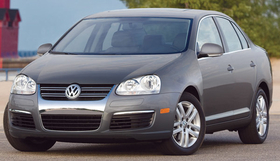 Unlike other manufacturers in the U.S., VW has been a proponent of diesel vehicles, such as the 2009 Jetta TDI. Volume automakers have put the brakes on nine diesel-powered vehicles that had been scheduled for 2010. Honda, Chrysler, Ford, General Motors, Nissan and Toyota have postponed diesel programs because of spiraling costs and other problems. Financial problems halted the programs at some companies. Others, like Toyota Motor Corp., are looking elsewhere for fuel economy. "We are banking heavily on hybrids," said Toyota spokesman Curt McAllister. Only German automakers — Volkswagen, Audi, Mercedes-Benz and BMW — have followed through with plans to launch U.S. diesels on time. Most German diesels are in premium vehicles similar to vehicles built in large numbers for Europe and other markets. That volume reduces development and production costs per vehicle. A diesel engine typically delivers fuel economy 20 percent to 30 percent better than that of a gasoline engine. But a diesel can add between $3,000 to $8,000 (about 2,135 euros to 5,700 euros) to a vehicle's price. Costly components include the turbocharger, the high-pressure fuel-injection system and the complex emissions system, which is filled with precious metals. That cost seems to be a barrier for the mass-market brands. Still, the new German diesels are selling well. The price of diesel fuel may be a factor. It has dropped from its high last summer of $4.85 per gallon — considerably more than gasoline — to $2.63 last week, a few pennies less than a gallon of regular gasoline. Bernd Bohr, chairman of the automotive group at Germany's Robert Bosch GmbH, knows costs have to come down. Bosch, the world's largest supplier of diesel fuel injection systems, supplies all the new German diesel-powered vehicles in the United States. "It's always a question of the cost-benefit relationship," Bohr told Automotive News recently. Just one part of some diesels' emissions system — urea injection — can add $1,000 to the cost of the vehicle. A turbocharger, high-pressure fuel injection system and diesel particulate filter pump up the price, too. Bohr said Bosch is attacking the cost problem in at least two areas: reducing the amount of oxides of nitrogen, or NOx, produced in the engine — which means a smaller amount of expensive precious metals are needed in the emissions system — and standardizing parts for larger production runs. Bohr thinks manufacturers eventually will be able to sell vehicles with six-cylinder diesel engines of about 3.0 liters profitably and in high volumes in the United States. "Maybe some of the projects our customers had in the past, maybe V-8s, were a little oversized in today's world," he said. "They are now looking at six-cylinders, maybe 3.0-liter diesel engines. That could be something very much worthwhile for the American market." Kevin McMahon, a partner at the Martec Group, a consulting firm, says the way the EPA calculates fuel economy and carbon dioxide standards gives gasoline-electric hybrids an unfair advantage over diesels. In 2006, the EPA revised the way it determines real-world, "window sticker" fuel economy to reflect U.S. driving patterns. The EPA's new sticker rulemaking assumes Americans drive 43 percent of their miles in city conditions and 57 percent on the highway. But under fleet average standards for corporate average fuel economy and CO2, vehicles are certified using 35-year-old test weighting of 55 percent city and 45 percent highway driving. "Diesel vehicles that perform very well at high-load and high-speed driving — where most of America's fuel is used in the real world — are penalized," says McMahon. "Meanwhile, vehicles that perform very well in stop-and-go driving, like hybrids, are overrewarded." The image of the diesel engine may be one reason Toyota has halted its plans. Says McAllister: "One of the obstacles of the diesel is the aged perception that the diesel is smoky and stinky. It's hard to change the mind-set of consumers. Hybrid technology has such a clean halo to it."